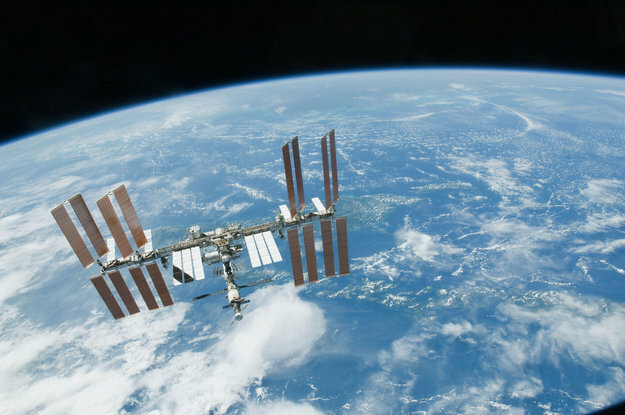 The previous entries on Space Station science can be found here and here. The last blog entry on my favourite science experiments will focus on biology and medicine. 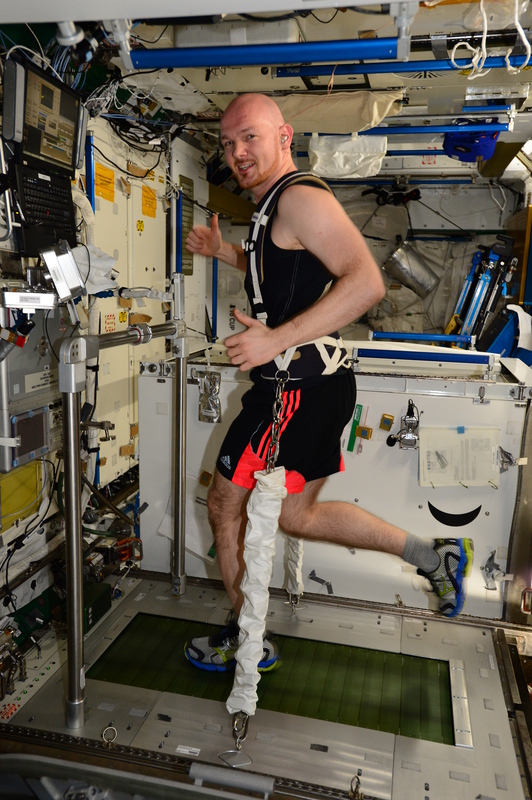 Going to space has changed my body in many ways. I receive more radiation up here, since we do not have our planet’s atmosphere to stop harmful solar and cosmic particles. My spine has enlarged due to living in weightlessness and the blood in my body does not naturally fall to my feet as on Earth. 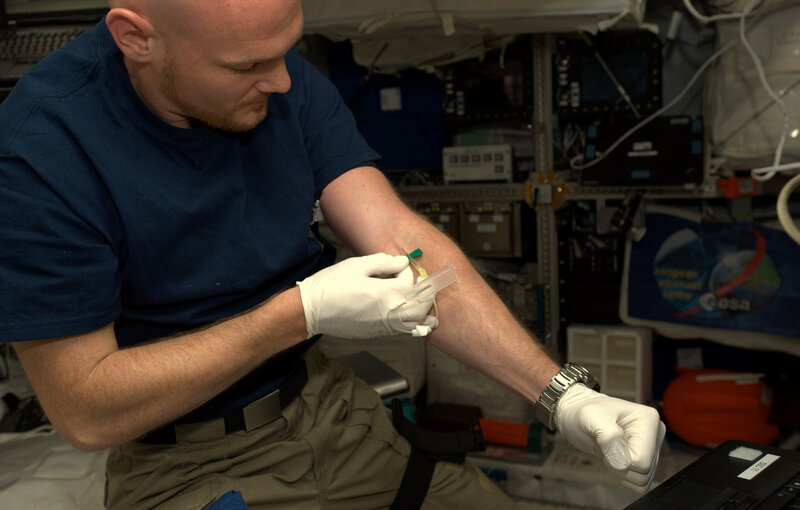 A human body is amazingly resilient, I hardly notice any of these changes and a team of medical doctors monitors all astronauts to make sure we stay healthy. Regardless, these factors put a strain on our bodies that is similar to rapid ageing. If we did not exercise, our bones and muscles would waste away. Our skin is less elastic, not to mention that our immune system works less well. Research teams have been looking at ways to prevent these changes since the early days of spaceflight, and great advancements have been made. Some of my muscles have surely shrunk since I arrived up here, while others have even grown since I started working in the Space Station. But then I do work out 2.5 hours each day up here – doctor’s orders. Much of the research in medicine and biology is looking at helping astronauts preparing for even longer missions further away from our planet, but the results are directly applicable to people on Earth. Having six people living in close quarters for six months in a controlled but extreme environment is an opportunity for many researchers to study changes to our bodies. We collect samples of bacteria on and in our bodies, we record our immune system state through regular blood, urine and saliva samples, play with different diets to see the effects, have our brains scanned and do ultrasound on our hearts. All this research is helping medical researchers understand in more detail how our bodies cope with living in stressful conditions and how we age. 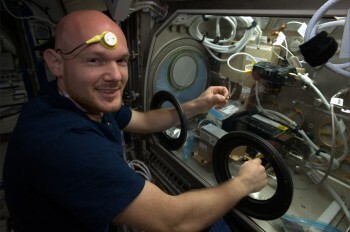 This type of research on the Space Station has already developed new vaccines against salmonella, help asthma patients monitor their affliction, improved guidelines to combat osteoporosis and arteriosclerosis and hinted at the mechanisms we could use to keep human cells living healthily forever. One experiment in particular could have far-reaching consequences. We are investigating an approved drug used against diabetes that also appears to stop cancers from developing. Using the drug on yeast cells up here will show how it works against cancer and allow researchers to adapt it for use on Earth. 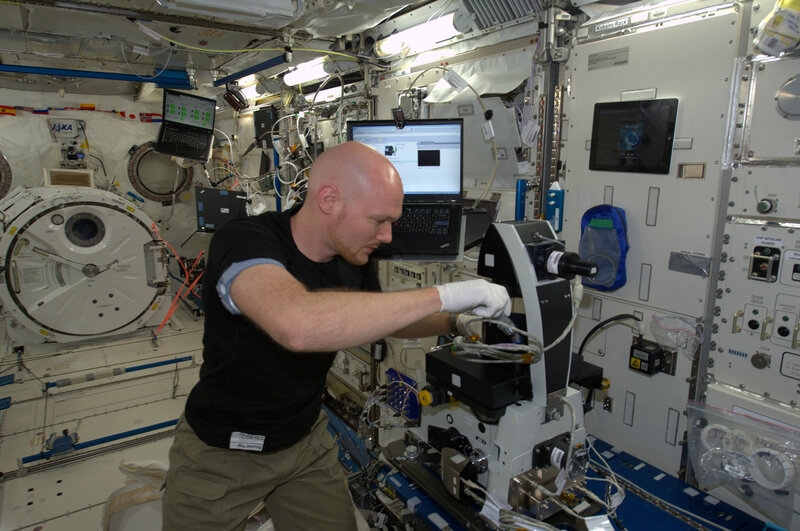 We do this research in space because weightlessness appears to affect drug delivery in yeast cells on a molecular level in a way that resembles how a human body absorbs medicine. The weightless yeast is a stand-in for human testing. Reid and I have been looking closely at our skin for ESA’s Skin-B experiment. We collected data with a number of machines to check the structure, oxygenation, hydration and elasticity so that scientists on Earth can develop models of how skin ages. This could be done on Earth but it would take decades to monitor people throughout their lives, while our skin provides valuable information more quickly. Luckily, most of the effects are reversible after we come back on Earth, which is yet another opportunity to study how ageing works. 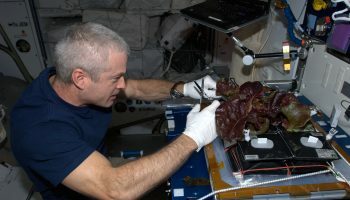 Throughout my mission we have been growing plants in space to prepare for even longer missions, where supplies from Earth are not possible. 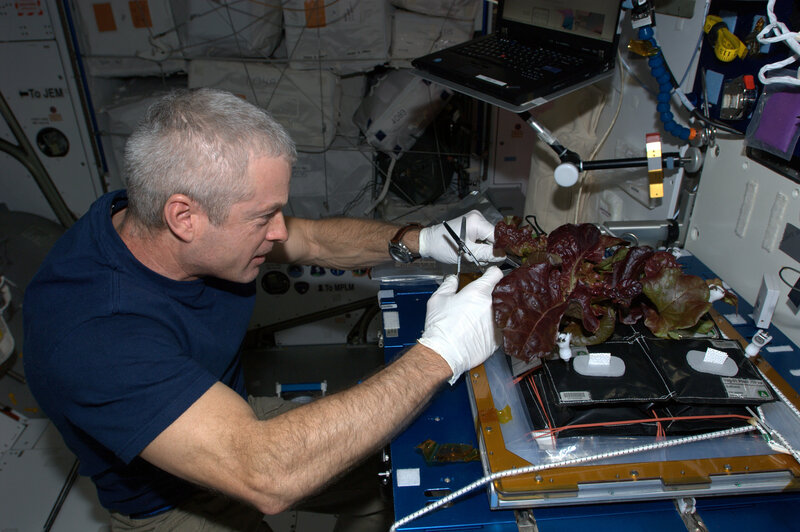 Fresh food is one of the things astronauts miss most while in space – there were times up here when I would have traded a kingdom for a bowl of salad. So you can imagine just how much I look forward to eating fresh fruit and vegetables soon! The research is done to understand how plants grow and improve their yield is of course great for our planet, which is supporting more and more people every year. I have sent many pictures of agriculture in water-scarce areas, and with the current climate change this problem will get more and more severe for certain areas on our planet. Our research might eventually help to grow plants more water-efficiently, meaning to produce more food with less water. 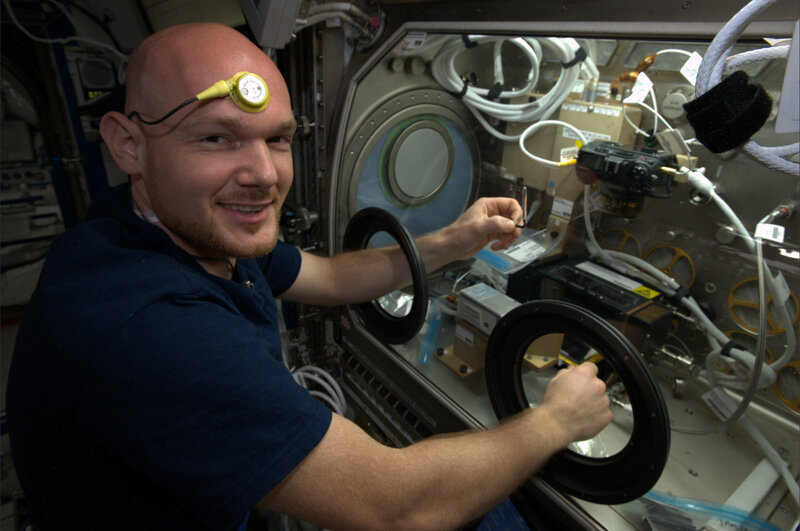 Right next to my sleep station, in the KIBO module, a Japanese experiment is growing protein crystals without gravity, which scientists think could lead to a whole new class of pharmaceutical drugs. Our body has over 100 000 kinds of protein and we need to understand how they work, becausethey are involved in almost every function in our body – from DNA to transporting molecules. Unlike on Earth, in weightlessness we can grow perfectly-formed crystals that allow researchers to pinpoint the detailed effects of chemical reactions,while knowing that gravity had nothing to do with the final shape. Once we know how and when proteins are active we could apply substances that stop a proteins from functioning – halting a disease in its tracks! If you followed my mission you might have seen a few pictures of an orbital sunrise. We experience 16 of these every day and each and every one of them appears to be more beautiful than the last. 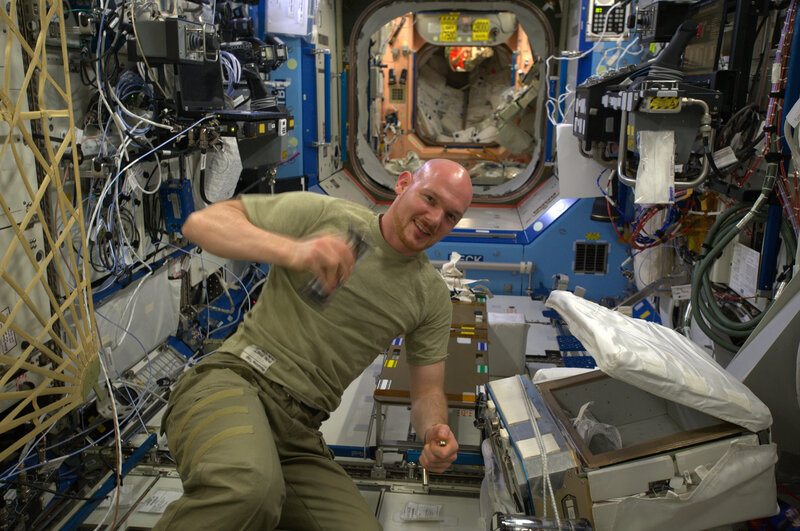 On the Space Station we live according to UTC time, but nobody really knows how our bodies adapt to living in a place with no real night and day cycle. To get behind that, I have been wearing a temperature sensor and recording levels of Melatonin to monitor my sleepiness and alertness in an experiment called “Circadian Rhythm”. This research will have direct benefits for people that work long or irregular hours – emergency doctors, ambulance drivers or night-shift workers. A more fun experiment (for me) was driving the Meteron robot in The Netherlands using a new ’space internet‘. This experiment is designed to control robots on a distant planet but the technology behind it is perfect for remotely operating in areas that lack infrastructure, and where precision and dependability is vital such as for earthquake response or remote-controlled surgery. Not all the experiments we do here are about improving lives. Some are actually investigating where life on Earth came from! Pay a thought to the bold organisms on ESA’s EXPOSE facility that are right now being subjected to outer space. 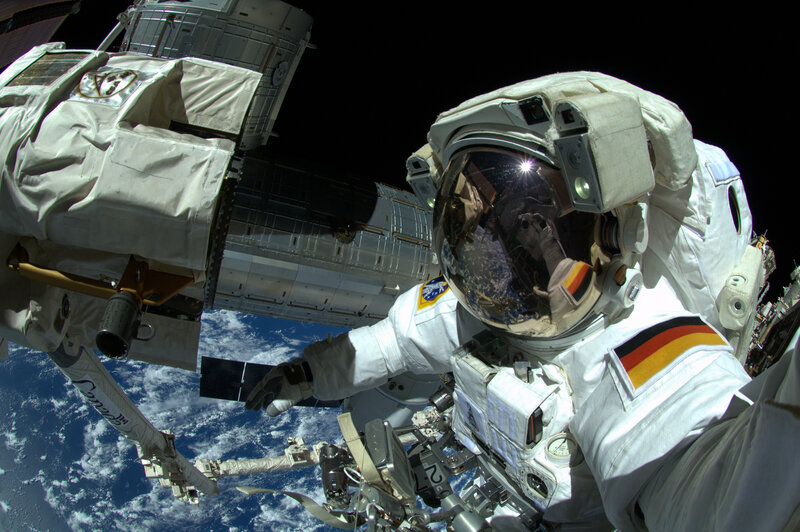 Strapped to the outside of the International Space Station these bacteria, cells and organic compounds have to endure the freezing cold of –12ºC to +40ºC the blinding sun, cosmic radiation and a deep vacuum for 18 months. To humans, this environment is so deadly that it took Reid and me four hours just to dress up and get ready for our spacewalk. In contrast, these organisms are out there entirely unprotected – and yet they survive. Amazingly, previous EXPOSE experiments have shown two types of organism that can survive in outer space: lichen and tardigrades, also called “water bears”. This research has proven that it is possible that life could have travelled to Earth from another region in the universe without the need for a spacecraft. Could comets and asteroids possibly serve as a shuttle to distribute life forms in the universe? That is one of the next big mysteries for space research to solve. Stay tuned! Two days after Reid, Max and I land on Earth, ESA’s comet hunter Rosetta will investigate this question when she sends her Philae lander to explore a comet from up close for the very first time – right on the surface of comet 67P. While I am getting accustomed to gravity again at the European Astronaut Centre in Cologne, I will definitely be watching this amazing venture of Rosetta. Fascinating read, Alex. I’ve been following you, Reid, and Makc on Twitter (pseudonym „DeepDish_“<–from a witty joke on Craig @craigyferg Ferguson's show) and find the work on ISS entirely engaging and intellectually stimulating. 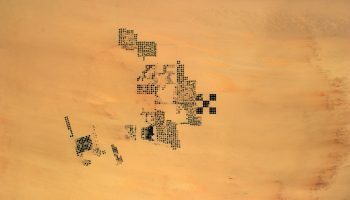 I've joked to myself, that while the beautiful pictures posted from orbit totally wow us, I find myself wanting to "look under the hood, and kick tires" so to speak. (Reid might explain the expression since it derives from American colloquialism, but you probably get it with your demonstrated fluency in communicating with us.) In that respect, your blog has been timely and clarifying in satisfying that curiosity, from how does ISS protect you from radiation when you go flying through those mesmerizing auroras to what/how you eat. I'll try to keep this fan intro brief, and stay in touch with questions as I continue to follow your work. Nice work on the film teaser for the #MyAmbition. It is the focus of my meditation and yoga practice, and probably what keeps me alive through the adventures life puts me through. Egads, let me stop talking. Enjoy the remainder of the trip and have a safe return. I'll be glued to NASAtv until your safe landing, and Monday Q&A. Very interesting blog and I had no idea how the human body deals with its normal functions in space. Water scarcity or water management is a great and huge project for many nations and of course throughout history our life line for human civilisation depends on it. I have studied the historical data of environmental impact on the waterways in Australia and China and the needs for knowing the environmental history of what has changed is very important as we learn how human interference has changed the diversity of many ecosystems. This has also ranged from a more recent population demand to over hundreds of years. Convincing governments to balance a struggling ecosystem in our waterways with the demands of agriculture and the economy is an uphill battle that continues constantly for many nations. Luckily we have scientists to collect and collate the data to keep informing the public of the changes being made. In the end, the public are the voice to convince governments to make changes and the information needs to be given to all so an understanding is made. Fantastic blog and thanks for the chance to stop and have thoughts about your topics. Dear Alex, you and your colleagues have raised the bar for the rest of us. You have taught us to increase our expenditure of hard work, persevere and be adaptable in all situations, and to achieve, with enthusiasm, the goals we set for ourselves. Thank you. I have so enjoyed your activities aboard the ISS. I hope you continue with blogs after returning home. I hope your dissertation is available online. Having years of research myself in biochemistry, I am very interested. Best wishes! I feel grateful to you and the whole astronaut group for sharing your experience,and your work at the ISS with so much passion and eager. We, the younger generation are truly inspired and highly motivated to chase our dreams and achieve our goals for the future. I think we have some of the greatest role models in order to learn and evolve as scientists and human beings. Thank you for boosting the skills and enhancing the ideas. I am looking forward to meet you someday in the near future.